An updated overview of expanded CRISPR research applications, including immunoprecipitation, epigenetic modification, live imaging, and therapeutics. New CRISPR/Cas9 workflows and case studies to help you start using this technology in your research. 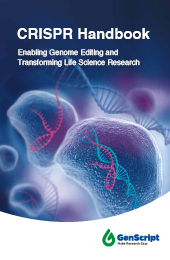 New crRNA/Cas9 work studies to optimize your CRISPR editing efficiency. Title*: Ms. Mr. Mrs. Dr. Prof.
GenCRISPR™ services and products are covered under US 8,697,359, US 8,771,945, US 8,795,965, US 8,865,406, US 8,871,445, US 8,889,356, US 8,889,418, US 8,895,308, US 8,906,616 and foreign equivalents and licensed from Broad Institute, Inc. Cambridge, Massachusetts. The products and the reagents generated from these services shall be used as tools for research purposes, and shall exclude (a) any human or clinical use, including, without limitation, any administration into humans or any diagnostic or prognostic use, (b) any human germline modification, including modifying the DNA of human embryos or human reproductive cells, (c) any in vivo veterinary or livestock use, or (d) the manufacture, distribution, importation, exportation, transportation, sale, offer for sale, marketing, promotion or other exploitation or use of, or as, a testing service, therapeutic or diagnostic for humans or animals. The purchase of the GenCRISPR Services and Products coveys to the purchaser the limited, non-transferable right to use the products purchased and the reagents generated from GenCRISPR services and any related material solely for Research Purposes only, not for any Commercial Purposes. Have questions? GenScript's Ph.D.-level service representatives are available 24 hours a day, Monday through Friday, to assist you.